We’re well into 2019 now, and unusually I find that I still have a substantial number of photos from last year still to share. In particular, there’s a few from Iceland and from the Lake District, so I’ll try to share these with some regularity over the coming weeks. 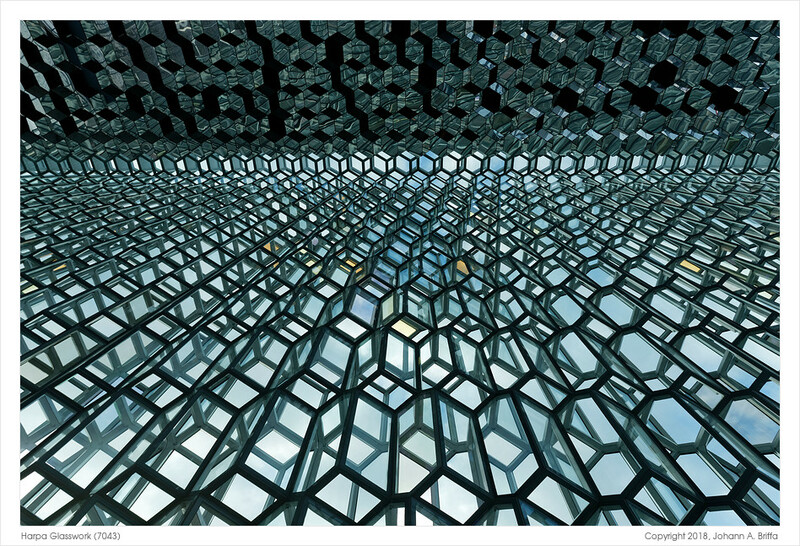 Today’s photo is an interior detail from Harpa, a concert hall and conference centre that stands proud by the marina in Reykjavík. The building has a very particular (and striking) architecture, with lots of glass “windows”. Not all of the panels are the same colour, and while there is a clear pattern to the structure itself, it does not really appear repetitive. Together, they have the effect of making the building appear more organic. I took a number of photos in this building, but I think only two really made the cut. This is the first, and the more abstract of the two.